In a new book, a Vatican archbishop has chronicled the birth pangs of the liturgical reform generated by the Second Vatican Council and warned of a Roman Curia tendency to return to a "preconciliar mindset." The book, "A Challenging Reform," was written by Archbishop Piero Marini, who recently ended a 20-year tenure as papal liturgist. His Vatican career began in 1965 in the office charged with implementing liturgical renewal. Archbishop Marini recounted the rise of a decentralized and dynamic reform movement in the 1960s and its "curialization" in the 1970s by Vatican officials afraid of losing control. Many of the hard-won liturgical changes were accompanied by tensions and disagreements inside the Vatican's central bureaucracy, he said. The archbishop's book, published by Liturgical Press, was scheduled for presentation Dec. 14 in London, where the author was being honored at a reception hosted by Cardinal Cormac Murphy-O'Connor. The book offered an unusual look behind the scenes at the Vatican, beginning with the Second Vatican Council's approval in 1963 of the Constitution on the Sacred Liturgy, which launched an extensive revision of Catholic worship. In 1964, Pope Paul VI established the Consilium for the Implementation of the Constitution on the Liturgy, an international body that operated with considerable independence from existing Roman Curia offices. From the beginning, Archbishop Marini wrote, the consilium's efforts met with resistance from traditionalist Curia members, who tried to curb the reform by "opposing real liturgical change and maintaining the status quo." In 1969, the consilium was transformed into the Congregation for Divine Worship. Just six years later, the worship congregation was disbanded under growing criticism from other Vatican offices. "This was probably one of the first signs of a tendency to return to a preconciliar mindset that has for years now characterized the Curia's approach," Archbishop Marini said in the book's conclusion. "As more and more time passes since the Second Vatican Council, an event charged with such hope and desire for renewal, its distinctive contributions seem to be increasingly questioned," he said. The archbishop's perspective may assist Catholics in discerning the reason why Archbishop Piero Marini recently ended his 20-year tenure as papal liturgist. 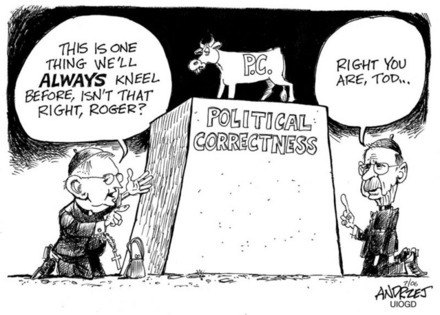 I wish I had seen this post before Cardinal Ratzinger was elected. Larry O'Connor is a seer. After two more rounds of balloting this morning, the College of Cardinals was unable to agree on a choice for the new Pope. There will be two more rounds of balloting this afternoon. Dan m. from New England Republican contends in a comment below that Ratzinger's chances are high early in the conclave and toward the end -- the middle stretch is least favorable to his chances. And that appears to be where we are now. Thanks to William at Eagle and Elephant, here's a link to Cardinal Ratzinger's "Dictatorship of Relativism" homily from Monday morning's pro eligendo summo Pontifice Mass. William found it at the Vatican Radio website (which I'll add to the links. Thanks again, William!). You can also read it at HughHewitt.com (HT Prying1). In the second reading, the letter to the Ephesians, we see basically three aspects: first, the ministries and charisms in the Church, as gifts of the Lord risen and ascended into heaven. Then there is the maturing of faith and knowledge of the Son of God, as a condition and essence of unity in the body of Christ. Finally, there is the common participation in the growth of the body of Christ - of the transformation of the world into communion with the Lord. However, we have a different goal: the Son of God, true man. He is the measure of true humanism. Being an “Adult” means having a faith which does not follow the waves of today’s fashions or the latest novelties. A faith which is deeply rooted in friendship with Christ is adult and mature. It is this friendship which opens us up to all that is good and gives us the knowledge to judge true from false, and deceit from truth. We must become mature in this adult faith; we must guide the flock of Christ to this faith. And it is this faith – only faith – which creates unity and takes form in love. On this theme, Saint Paul offers us some beautiful words - in contrast to the continual ups and downs of those were are like infants, tossed about by the waves: (he says) make truth in love, as the basic formula of Christian existence. In Christ, truth and love coincide. To the extent that we draw near to Christ, in our own life, truth and love merge. Love without truth would be blind; truth without love would be like “a resounding gong or a clashing cymbal” (1 Cor 13,1). I've been searching for the full text of Cardinal Ratzinger's "Dictatorship of Relativism" homily, given this morning at the pro eligendo summo Pontifice Mass. If anyone has a link, I would be eternally grateful for it. I heard Hugh Hewitt promising to have it up on his blog soon, but if anyone else can direct me to a site that has it, I'd like to get it up here4 ASAP. It is a phrase that will echo for some time to come -- and so easily dominates the mewlings of the waning liberal forces within the Church Militant. Has The Ratzinger Tide Ebbed? Right you are. In my rankings he dropped from 4th to 10th as soon as the first puffs appeared and no bells were heard. The more I look at it, the stronger Castrillon Hoyos emerges as the next pope. Any chance he could take the name Formosus II, I wonder? 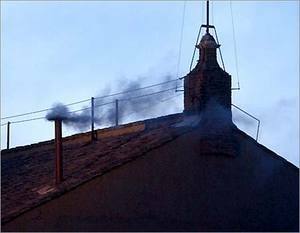 CWNews.com and Reuters report black smoke from the Sistine Chapel chimney, signalling the College of Cardinals had fialed to elect a pope. Actually, it would have been a surprise had it been otherwise -- no one expected white smoke on the first day of the conclave. When the first puff of smoke came from the chapel chimney, it was at first difficult to determine whether the smoke was black, indicating no decision, or white, indicating the election of a pope. A few people even shouted, "Bianca, bianca" ("White, white"). But after a few moments, it became clear that thick black smoke was pouring from the pipe. It was accommodated by cries of surprise and the crackling of camera flashes. In a further meditation on the Letter to the Ephesians, the cardinal focused on St. Paul's remarks about those who are "tossed to and fro and carried about with every wind of doctrine." That description, he said, captures the troubles of the current age. "The little ship bearing the thoughts of many Christians has often been shaken," he explained, mentioning the ideological forces "from Marxism to liberalism, even to libertarianism; from collectivism to radical individualism; from atheism to a vague mysticism; from agnosticism to syncretism." In our era, he said, "a dictatorship of relativism is being formed," which the faith must oppose. "Dictatorship of Relativism" -- what a powerful phrase. I hope the cardinals took that homily to heart and will bear it in mind during this conclave. It's homilies like that cause me to hope that when the white smoke does rise, it's Ratzinger who appears at the balcony. 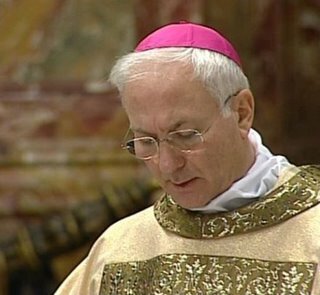 Cardinal Jospeh Ratzinger seems to be firing back at his heterodox German counterpart, Cardinal Walter Kaspar (reported by Reuters). "An adult faith is not one that follows tides of trends and the latest novelties," he said in a homily, denouncing a "dictatorship of relativism" that denied the existence of absolute truths promoted by the 2,000-year-old Church. This appears to be a direct reponse remarks by Kaspar. CWNews.com has a more in-depth story here.